Anyone who knows me will understand that I am a sucker for a good bargain, especially when it comes to a flight deal. I can’t resist having a little peek every time I get an email from my go-to airlines, and am always tempted to book something just because it is cheap! Plus, travelling is my passion so when I find an opportunity to do it more often for less money, I’m going to take it. 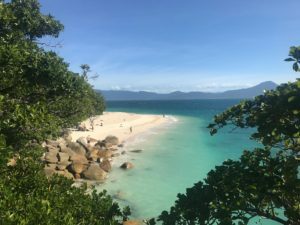 So, when I found $100 return flights to Cairns from Sydney during the week of my birthday, I just couldn’t resist the bargain… and that’s how I found myself in Cairns, QLD for my birthday with my partner Scott and his parents, Johnny and Kaz. Our week in Cairns began at the ungodly hour of 4:00am on a Sunday morning. There’s not much that’ll get me out of bed this long before the sunrise, but a trip to the airport to fly to tropical North Queensland for the week is definitely one of them! The trip was rather uneventful, other than keeping myself amused by taking photos and videos of an unsuspecting sleeping Scott, and laughing deliriously to myself during the flight. We landed mid-morning, and found our clothes were definitely not suitable for a north Queensland winter. Sweating in our hoodies and long tights, we quickly got our hire car for the week and hightailed it to our apartment to get changed and begin our week of exploring the beautiful city of Cairns. We woke the next morning to a clear sky, full of sunshine – a far cry from the overcast, windy morning we’d become accustomed to in the lead up to winter on the south coast of NSW (yes, I know, we are sooks). Lazily, we got out of bed and began our Monday morning with a coffee on the esplanade, and a tourist guide to figure out exactly what we were going to do that day. 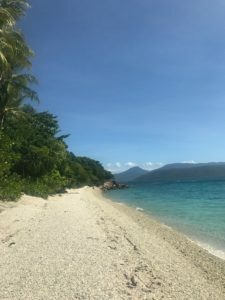 We learnt that Fitzroy Island was located just a 45-minute via boat from Cairns, and was a stunning tropical island covered in a lush rainforest and surrounded by its own fringe coral reef system. It only took a few sips of my soy latte to decide that was where I wanted to spend the day. An hour later, we were boarding the Fitzroy Fast Cat en route to the island, with nothing but idyllic beaches, tall palm trees and plenty of sunshine waiting for us at the other end. Immediately after arriving, we headed straight to the beach on Welcome Bay, walking carefully across the scattered pieces of mismatched coral to a spot under a large palm. Eager to try out his new Sony A6500, complete with an 8-inch dome port and underwater housing (special thanks to our mate Hippy from Salty Surf Housings for the loan), Scott made a beeline to the salty water with his snorkel and fins. Johnny, Kaz and I decided to relax on the beach for a bit longer, taking in the delicious sunshine. After a while, Johnny decided he wanted to join the snorkelling fun, so after renting another snorkel set from the nearby beach shack, he came past our towels and generously offered me first use of the snorkel. “Nah, I’m all good, Johnny! You go first, and I’ll head in once you’ve had enough” is what I replied. Within a mere two minutes of Johnny entering the water, we were interrupted from our sunbaking to hear ‘Turtle! Turtle!” We glanced up, and Johnny was waving his arms indicating that he was, in fact, in the presence of a sea turtle. For as long as I can remember, it has been my dream to swim with a sea turtle. 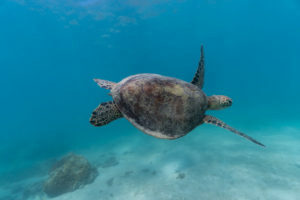 I’ve swum in some seriously incredible waters, such as the Cook Islands, Fiji, the Bahamas, the Dominican Republic and even on the Great Barrier Reef off Airlie Beach, but never have I ever had the pleasure of swimming alongside a sea turtle. In the Cook Islands, I came close to realising my dream, however the turtles were so far in the distance I could barely make them out with my poor eyesight. Needless to say, I was bloody annoyed! Scott managed to swim over to Johnny in time to capture an incredible shot of the gorgeous sea turtle (find the shot available for print on Scott’s website here). When they returned from the water and I saw the photograph, I was even more devastated. Was I cursed? Why didn’t I accept Johnny’s offer to take the first snorkel? Did I give off an anti-turtle pheromone or something? Would I ever swim with a sea turtle, or was I destined to live the remaining days of my life without ever experiencing the one thing I have desperately wanted to experience? After a yummy lunch at Foxy’s Bar, we went for a quick walk over to Nudey Beach on the other side of the island. 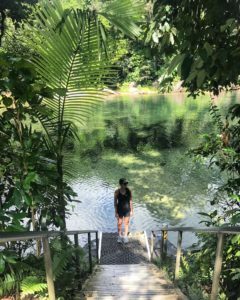 Following a gently hilly walking track through the tropical rainforest for about ten minutes, we emerged to find a small beach with white sand and startlingly aqua water. It looked like a real-life postcard, and all I could do was visualise a giant ‘Greetings from Paradise’ banner across the bottom corner of my view. As beautiful as it was, it was a bit too windy to relax on Nudey Beach, so we made our way back to Welcome Bay for the afternoon. As we resettled on the jagged coral beach, something caught Kaz’s eye in the water. “Look,” she said, “Is that another turtle?” We all cast our eyes to the spot she was pointing toward, and low and behold, it was the back of a sea turtle coming up for air! “Quick, get in the water!” everyone cried as I hastily grabbed the snorkel and fins while Scott put his camera gear together to follow me out to the water. I walked awkwardly down the slippery coral in my fins, creeping closer to the water’s edge before launching myself into the salty sea and started frantically swimming in the direction of the turtle sighting. Spoiler alert: it wasn’t a sea turtle. It was, however, a buoy. A buoy that was suspiciously turtle shaped. It wasn’t until I got close enough to see the rope and the concrete block holding it to the sea floor that I realised that my turtle dream was not going to come true that day. I swam forlornly to the ocean trampoline a few metres away (yes, it was as awesome as you’re picturing in your head right now), and sat on top, too disappointed to even bounce off the side. I returned to the shore after a few moments on the ocean trampoline, and swam as quickly as I could through the masses of tiny stingers, whose presence in the water went unnoticed on the swim out. As I got back to the shore, I took off my fins and stepped cautiously on the coral sand, thinking to myself, “Am I actually cursed?” Cue sad face. What a view! Babinda Boulders. Waking up the following morning, I was instantly reminded of the lack of turtle sightings I had the day before. In an attempt to shake off my disappointment, I got out of bed, had a delicious breakfast and got ready to head south of Cairns for a day of exploring in nature. 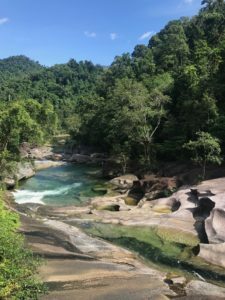 The four of us jumped in the hire car and began travelling south towards the famous Babinda Boulders – a stunning section of rainforest with huge, naturally formed granite boulders found along Babinda Creek. We arrived mid-morning to find few others exploring the area, making for a quiet, serene environment. We wandered through the well-groomed picnic area until we found the shore of the still creek, hearing nothing but the chirps and hums of native birds and insects in the distance, and gobbling of the bush turkeys who called the surrounding area home. The gorgeous creek at Babinda Boulders. After admiring the view, we began to walk down the sealed footpath leading to the lookout points for the boulders. As we made our way down the track, we began to hear the ferocious roar of the water surging through the large granite formations, and eventually found the first lookout. We stood and watched the thunderous water as it rushed between the boulders, admiring the incredible patterns on the rocks that had been forged by the creek over time. It was beautiful. Continuing down the path through the rainforest, we came across another lookout point, and it was here that we couldn’t stop staring. There was a short, cascading waterfall which relaxed into a gently flowing stream of cool, clear water across the granite formations, surrounded by luscious, green rainforest. We spotted a few Ulysses butterflies fluttering between the trees, their strikingly bright blue wings contrasted against the colour of the rainforest. It was such a peaceful, beautiful moment. Despite our much-anticipated overnight reef sleep being cancelled, we were still heading out to Sunlover’s brand new pontoon on Moore Reef for the day. 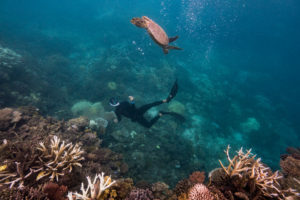 I was beside myself with excitement at the prospect of visiting the Great Barrier Reef for the second time, and even more excited to be visiting Moore Reef. We had previously visited the Great Barrier Reef via Airlie Beach, and were left a little disappointed. We were greeted at check in by the lovely Karina, who escorted us on board and introduced us to marine biologist Pablo, who would later take us on the best snorkel safari of my life. We got settled into our seats, and began the rough boat journey out to Moore Reef. The trip was bumpy, and more than a few unlucky souls got very seasick, but luckily for us we’d had ginger tablets about half an hour before getting on the boat. Even if you don’t get seasick, I’d recommend having the ginger tablets (which Sunlover kindly provided free of charge) beforehand. Unbeknownst to the rest of the group, I was teeming with a combination of excitement, nerves and fear. I was still incredibly anxious to see, let alone swim with, a sea turtle, and I didn’t want to get my hopes too high in case my ultimate dream wasn’t realised. I figured, however, that with a guided snorkel tour by someone who knows the reef very well, plus a bit of good old-fashioned birthday luck, the universe would come together and deliver to me the greatest birthday gift of all. Pablo began gesturing calmly towards the left, and as I got a bit closer I realised that there was a green sea turtle floating casually just mere metres from us. I began squealing excitedly into my snorkel as I swam closer to the beautiful creature. Her tough shelled body was close enough to reach out and touch, and it took all my inner strength not to pull her into a tight embrace. This was it! It was happening! I wasn’t cursed, there was no anti turtle pheromone. My wildest dream, the one thing I’ve wanted to do since I first learned about the existence of sea turtles as a child had come true. All within ten minutes of arriving at Moore Reef! I felt like I was floating on air, despite actually floating in the ocean. We all came to the surface after our turtle encounter and I was able to squeal with joy without the restriction of my snorkel. 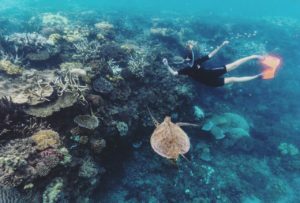 “Take me home,” I cried, “I’ve already seen exactly what I came here for!” Pablo chuckled as we dove back under the water, changing our direction to explore more of the gorgeous Great Barrier Reef. I happily floated through the choppy ocean, staring through my snorkel mask at the mesmerising world under the surface, the memory of my turtle encounter still ever so fresh in my mind. I saw what I came to see, my dream had come true and a sea turtle had been swum with. What more could I wish for, right? Well it was about then that we saw our second turtle of the day, swimming a couple of metres away from the coral we were floating above. Again, excitement took over as we watched the creature swim slowly through the reef. A touch too far away to swim alongside, we admired the second sea turtle from a short distance before continuing our snorkel safari to another section of reef. Alas, the fun was not over! Yet another turtle had graced us with her presence, and to our surprise she came right up to Pablo, basically running into him as we swam closer to her. Her name was Linda, and it turned out that she was quite close with Pablo. You see, Linda lived on that particular section of reef, and Pablo had noticed she wasn’t feeding properly. In an effort to help her, he began spending time showing Linda how to find algae on the reef, and was careful not to support her too much in case she began to rely on him solely for food. When we came across Linda, our third turtle for the day, Pablo hadn’t seen her in about a month, so he was excited to see that she was back on the reef, well and thriving. The section of reef where we’d found Linda the green sea turtle was deep, and we watched in awe as Pablo dove down to the coral near the ocean floor, carefully showing Linda where to find the delicious red algae she needed to eat for breakfast. It was incredible to watch her swim right up to Pablo and almost take the algae from his hands, especially considering that she is a wild sea turtle. Unfazed by the five humans swimming around her, Linda swum through the salty water, gracefully gliding alongside the coral as I watched in amazement from above. This birthday luck was really something! We saw another two sea turtles on our way back to the pontoon, and my excitement didn’t waver slightly, even after the fifth sighting. My wildest dream was to swim alongside just one sea turtle, and my dream had come true five times in total, and I couldn’t have been happier. I don’t think the smile left my face that entire day. In fact, I don’t think it has left my face at all since that day. It was my best birthday ever! Our week in Cairns was coming to an end, and on our last day we found ourselves driving up a windy mountain road heading for Kuranda, a sleepy rainforest village at the very top. The sky was gloomy and drizzling with a light shower of rain, and the smell of the rainforest in the wet was delightful. We quickly found a place for breakfast and coffee, and devoured both before setting off to explore the tiny village. Though quite small, Kuranda was a bustling hive of energy, thanks to the natural beauty and relaxed atmosphere of the village. Markets and little shops adorned the streets, and there was definitely not a lack of things to discover. Kaz and I decided to check out the Australian Butterfly Sanctuary – a magical world full of beautiful tropical butterflies. The largest butterfly aviary and exhibit in Australia, the sanctuary offered us the chance to get up close and personal with the colourful creatures, and we loved wandering around the enclosure learning more about the butterfly’s life cycle and behaviour! Barron Falls – it would have been spectacular in full flood! 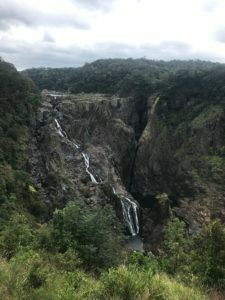 After our little butterfly adventure, we regrouped with Scott and Johnny and decided to check out the nearby Barron Falls, one of the most famous waterfall lookouts in North Queensland. The view was incredible, and we could only imagine how impressive it would be during the wet season, when the falls are in full flood and at their mightiest! After an amazing week in Cairns, including the most magical birthday ever on the Great Barrier Reef, it was finally time to head back home. We were exhausted, having barely spent any downtime during our trip, but I couldn’t have been happier. As we walked through the terminal ready to begin boarding the plane, I knew that it wouldn’t be long until we came back. After all, we needed to reschedule our Sunlover by Starlight trip with Sunlover Reef Cruises! DISCLAIMER – I travelled to Moore Reef as a guest of Sunlover Reef Cruises. All opinions remain my own.